Rosa Schaffer was an accomplished Cosmetics Entrepreneur in the late 1800s and early 1900s. You can read about her here. Rosa Schaffer was a pioneer in Women’s Beauty products. She tended to hold flowers in her advertising efforts to reflect the great aroma of her many products. Among some of her products were powders, skin creams, perfumes, hair coloring, conditioners, and more. Her favorite fragrance was Violet. 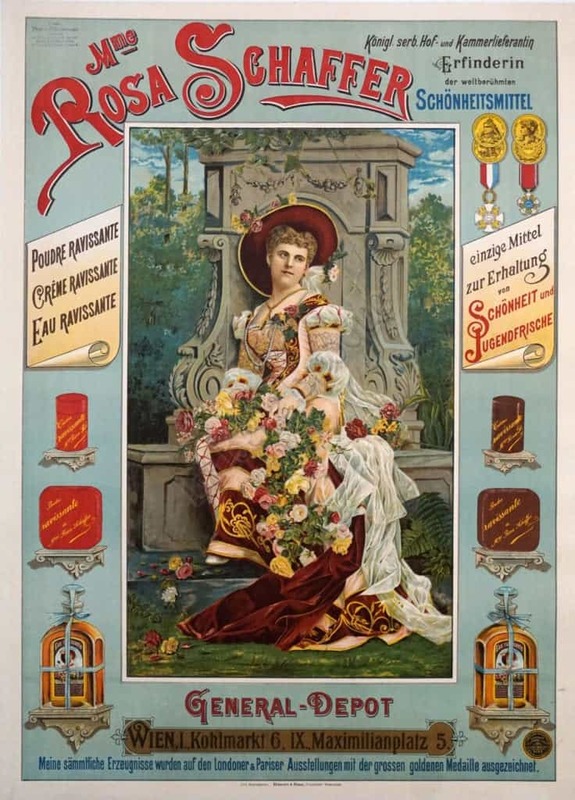 This poster is an advertisement for her shop in Vienna at the General Depot. The poster boasts her several awards won in London and Paris in the late 19th Century. Surrounding her picture is an array of many of her Cosmetic products.